Stanley/Bailey planes are ubiquitous. Yard sales will often have several of these old campaigners on hand, but sad to say, the majority of them have fractured totes and possibly a broken cast iron bed. Why is this so? It's related to how they were made. The use of non-ductile cast iron, also wood grain direction and age are the culprits. Bottom line; if you see a broken piece of wood, look for cracked metal. Wood can be fixed. Unless you're looking for parts however, the broken bed should be a pass. Totes on a plane go through a lot of dynamic stress. Additionally, the wood in these old tools often contains a lot of skin oil and grime from years of use. Repairing them can often be an exercise in futility. Additionally, you can carve a tote that will fit your hand, that will later make a tedious smoothing job downright pleasurable. 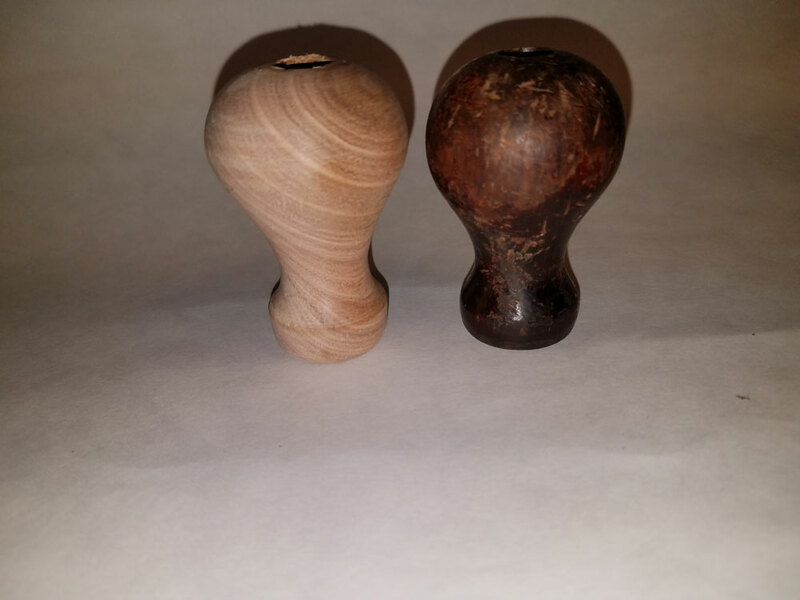 A specially carved and turned tote and knob can also be a source of pride sitting in your toolbox. replaced. Also, the repair wasn't important to him, so we didn't try to match wood species. completely. I've had very poor success repairing these. 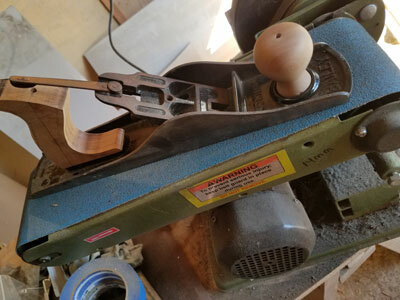 There is a lot of great information available for those wanting to carve their own saw totes, and it is pretty clear that totes for saws and planes are similar. 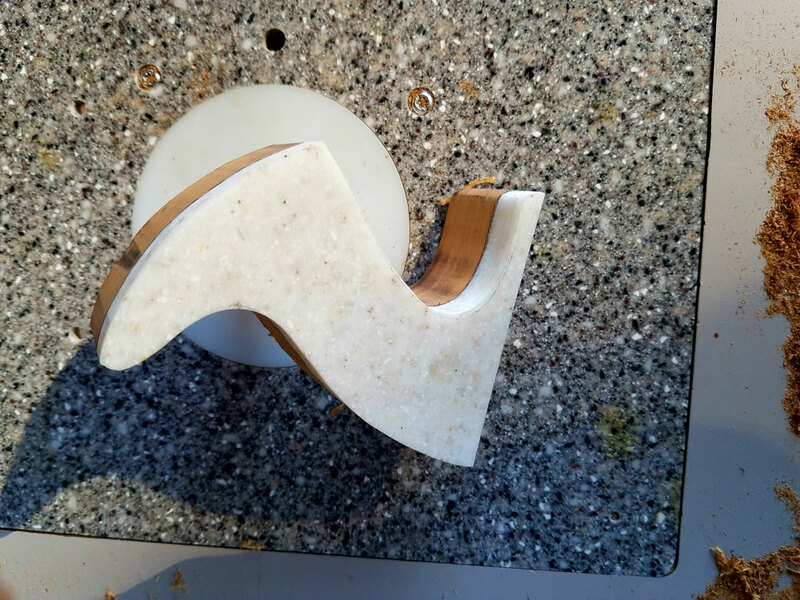 Methods for either both involve roughing the shape, machining it to fit the tool, then contouring, refining and finishing the final product. So if you have ever looked into carving your own saw totes, you are half way there to repairing the wood on that old broken plane! 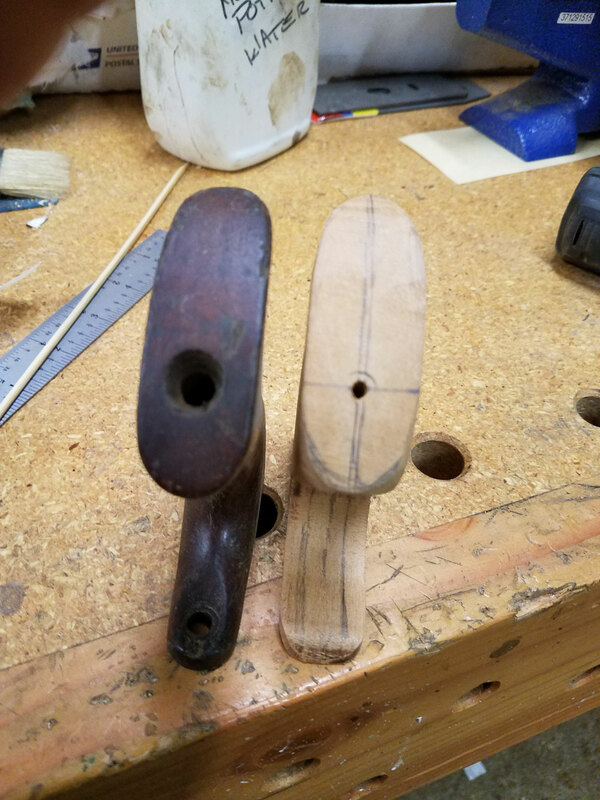 The most obvious difference between carving these two handles is sawing to fit a plate versus drilling to fit into the bed of a plane. The latter can be a bit tricky for the DIY'er, but it's not impossible. Grain should run parallel to the plane's bed just as with a saw. This offers crisper detail and easier rounding over. In fact with planes, the horn and toe would be far too delicate to stay attached if the grain ran vertically. 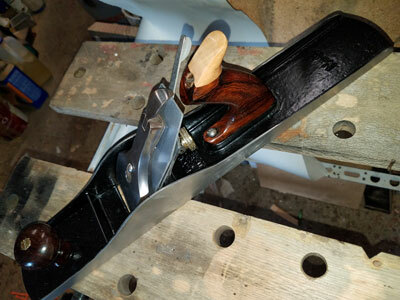 Generally, a plane tote is the replacement of an old part, whereas, a saw tote is often an original creation, either for a new saw, or upgrade for an old plate. Plane totes usually only need to be copied either from the broken one that was on the plane, or from other planes on hand. Keep in mind, Stanley totes were fairly redundant. Only two or three tracings taken from old planes will give you patterns for almost all old cast bodied planes. There are a couple of things to keep in mind here, however. Remember that a plane tote has to fit on the bed, sometimes with a mounting rim, and under both the iron and the lateral adjustment lever. Working from a pattern helps make everything fit, but it is also good to check and dry fit often while you work. Pay attention here. A lot of detailed rasping time can be wasted. 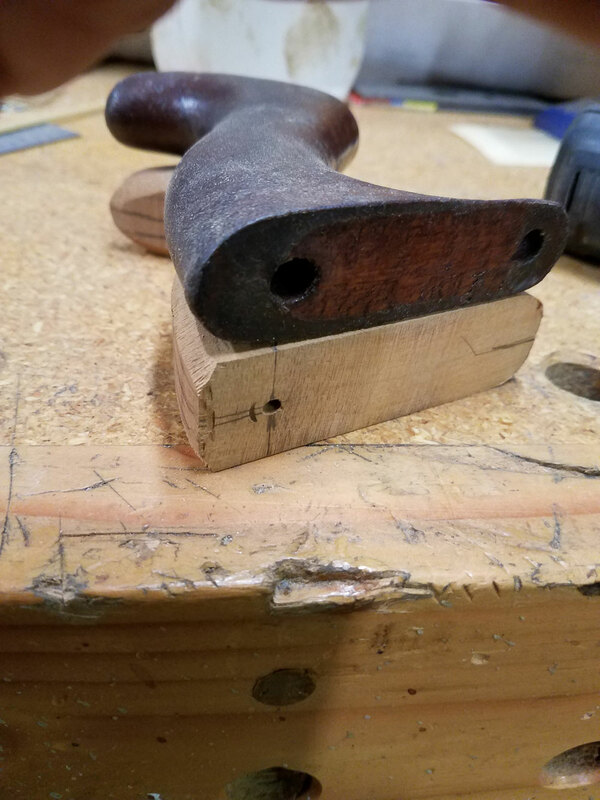 Along with connecting the through drilled holes, make sure your new tote fits the plane. Recreating a pattern is a simple enough process. Broken plane totes are easy enough to temporarily glue together. The horn will often be snapped off, but that can either be free hand traced or added on from an intact plane. One side note here; these patterns will often look "chunky" compared to what might be the graceful form of the original. Don't let this fool you. Remember, you are only looking at a profile here and a lot of wood will come off with the forming. It might be a good idea to carve a model at this point. This will help you with fit and finish as well as the fit of the part. by hand. Just plan on spending a bit more time. If you are going to make more than one tote, it's a good idea to save both the original tote and the pattern. Keeping them together in a plastic storage bag works well. Later the pattern will let you trace a new tote and act as a router guide, while the old tote will serve as a reference for hole drilling and forming. angle works great for tracing new patterns. Most old totes were made of rosewood or sometimes cocobolo. These woods are getting hard to find, but the beauty is you need so little stock to make a tote. 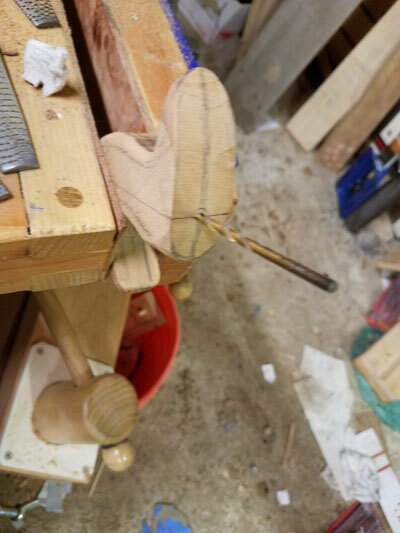 Woodworking and online stores often carry these woods as bowl blanks. I happen to like madrone and black locust. Another nice alternative is mesquite. What you are looking for is a species that is hard and close grained. There is so little of it that weight is not a big deal. Whatever you choose, get a little extra. This way you can match the tote with a turned knob. of finding interesting patterns from unlikely sources. 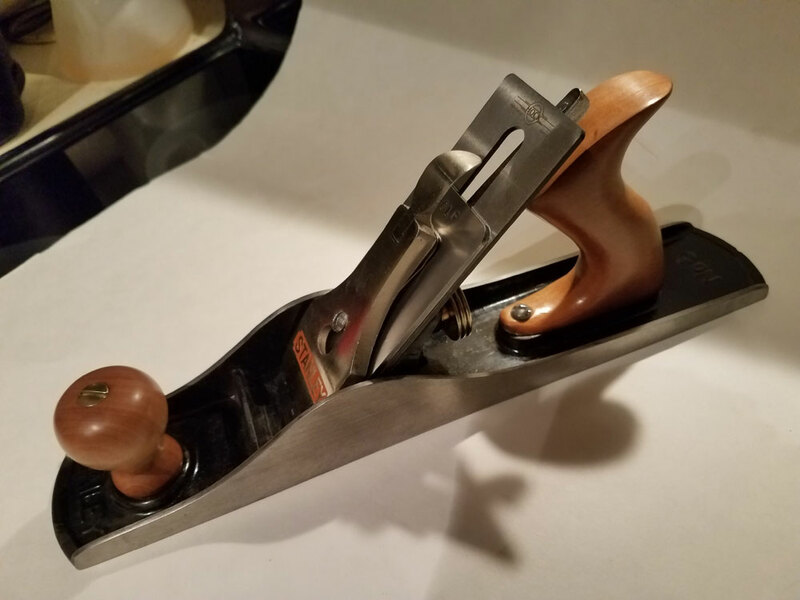 This is the big difference between plane and saw totes. A plane tote needs to roughly fit the existing angle of the existing tool. There needs to be an enlarged hole in the top for the mounting nut and possibly one at the bottom for a stud that may, but not always, be molded into the plane's bed. 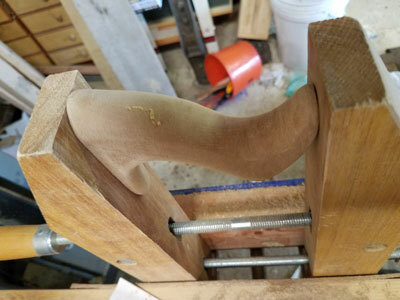 I've tried to engineer a number of methods to take the guesswork out of through drilling the hole for the long screw that holds the tote to the plane bed. In the end, I've found careful step drilling by hand from both ends towards the center works best. Keep two things in mind when doing this. First keep the initial hole as small as possible. This makes it easier to drill those larger holes on the ends. At the same time, the two holes have to meet in the middle. This seldom happens with small holes that are slightly off, but is corrected when the holes are enlarged. isn't the case. Looked at from a different angle, these holes line up. The key here is taking your time. I'll use an old tote and the mounting area on the plane bed to get an idea where these two holes need to start. Remember that the bottom hole starts at an angle, so the starting point will be a little further back than you might think. It's best to just make a small tick mark for these places on the edge of the top and bottom of the blank. Strike lines across at those points and find the middle of that cross line. Before you start drilling, connect these two cross lines on both sides of the tote. These lines will guide you as you drill. The line on the side offers a guide when drilling the holes. There's nothing stopping you from using an eggbeater drill. Just go slow and clear the bit frequently. I prefer a small cordless drill, however. Either way, it's to start with a 1/8 inch hole, but it's unlikely you will meet in the middle with this small size. Generally I'll go to a 9/64 inch bit next. If you have been careful, you will often feel the bit break into the second hole with this size. Blowing through one end will tell you if the holes have met, and if you are lucky you will even see light through them at this point. If not, step up to a 3/16 inch bit, but stop here. Anything bigger will make it difficult to center the larger bits for the mounting holes. It this is the case, drill the big holes, then step up to a 1/4 inch through hole. This should be your final size. 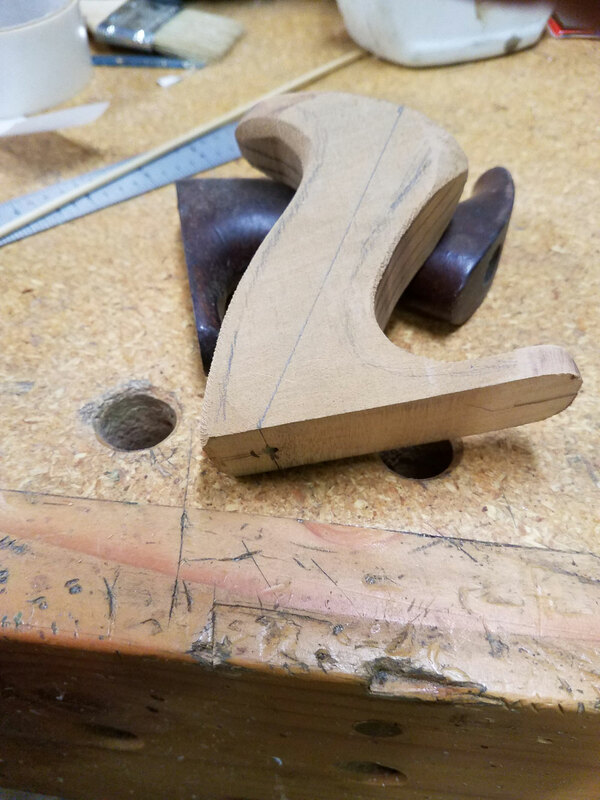 It's highly unlikely your holes will not have met at this point, but if not, you have not wasted time and effort shaping the tote. The small hole in the bottom of the toe is a no-brainer. Simply line everything up to mark for it. You should already have a center line. Either drill through or partly into the toe, depending on the size of the tote and how the original was made. If you have to drill a through hole, remember to flatten the top of it to allow the round head screw to seat properly. Plane tote shaping seems to have evolved over the years. Early on, they were rounder whereas later they had almost a “slab sided” appearance and feel. Whichever you choose is really up to you. I happen to prefer the older smoother style. Accomplishing this only takes a few extra minutes with a file. The shaping process is pretty much done with heavy files and rasps. Occasionally I will use my Shinto rasp, but this is rather aggressive. Whatever you take off here cannot be put back on, so take your time. The end is in sight! 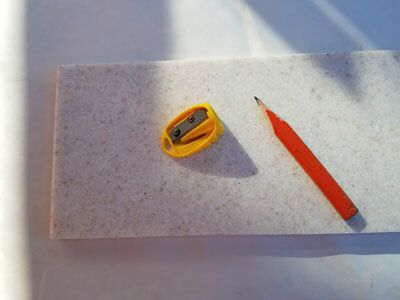 Other files I use are French (Lioger) flat and model makers files as well as riffler rasps. Once the tote looks good, feels right in your hand and fits into the plane, it's time to start sanding. There is a trick here. You will notice in some of the pictures that the tote is clamped into a hand screw. This is a trick Tom Callisto (Windward Woodworks) uses on saw totes and it works very well in this application. The trick here is to clamp the plane tote, bottom and top against the jaws. This holds it more securely and allows you to loosen, then rotate the tote in the clamp. Another trick here is to fold the paper strips into at least four layers. They tend to tear apart from the stress of sanding and pulling at both ends. shaping down the front and back of the tote, using the contour lines along the edges. This is not unlike shaping a saw tote. A friend once restored a No. 5 for me. Knowing I have ham hocks for hands, he put "extra meat" into the tote. It's a beautiful plane and I cherish and use it, but truth be told, it's actually a little uncomfortable. The moral here; big or small hands benefit more from refining a tote rather than making it bigger or smaller. Experiment, and when you find a pattern that fits, stick with it. You get a good feeling when a shape like this begins to emerge! Finishing totes and knobs can be personal preference. Remember that you're dealing with small pieces of wood that will be grasped tightly with sweaty hands, so whatever finish you apply, it should be hard wearing. A lot of people use various gun stock finishes, which is fine. I'm a bit old school here. I usually go for a prepackaged blond shellac (Zinsser) This comes in a three pound cut that I further dilute 1:1. I start by applying two sealer coats without rubbing between them. After that, I let each coat dry thoroughly, and then lightly rub with 00 steel wool. After five to six coats, a final buffed coat of wax can then be laid on. If the plane will be used outdoors, you might want to use Zinsser Sealer coat, or an oil-removed shellac. Also, apply the coats with a foam brush. It can be stored in a plastic bag between coats. The beauty of this finish is that it's durable, cheap, looks great and goes on quickly due to the fast drying time of the thinned shellac.